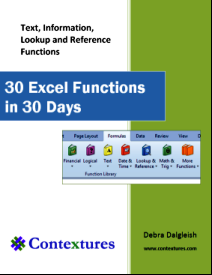 Learn how to calculate the fiscal year and fiscal month for a specific date. The formulas are based on the Fiscal Year starting date or starting month. 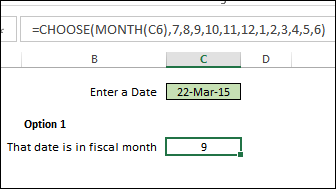 Based on the month number in which the fiscal year starts, you can use the IF function to calculate the fiscal year for any date. In this example, the starting month is entered in cell C4, and the date is entered in cell C6. 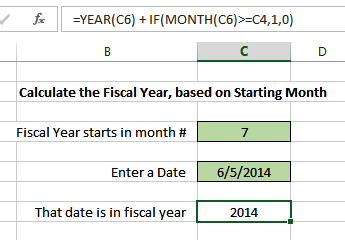 The formula result shows the fiscal year for the date. NOTE: Format cell C8 as General Number format -- it might show a Date format if you recalculate it. The formula calculates the year for the date entered in cell C6. If the month number is greater than or equal to that number, 1 is added to the year. If the month number is less than that number, 0 is added to the year. To calculate the fiscal month, you can use the CHOOSE fFunction. The CHOOSE function returns a value from a list, based on an index number. Based on the month number, the fiscal month number can be returned from a list of numbers. 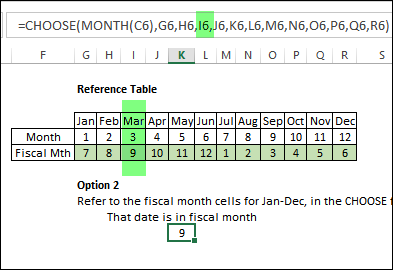 Those month numbers can be typed into the CHOOSE formula, or you can refer to the cells that contain the numbers. To calculate the Fiscal Month with the CHOOSE function, the date is entered in cell C6. If the date in cell C6 is March 22, 2015, the MONTH function will return 3 as the month number. To calculate the fiscal quarter, you can use the CHOOSE function. 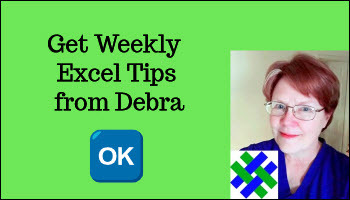 The CHOOSE function returns a value from a list, based on an index number. Based on the month number, the fiscal quarter number can be returned from a list of numbers. 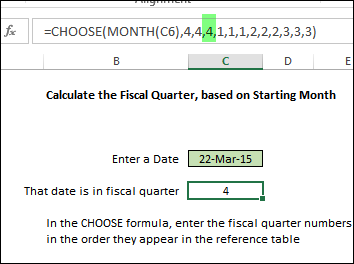 Those quarter numbers can be typed into the CHOOSE formula, to calculate the fiscal quarter for a specific date. To calculate the Fiscal quarter with the CHOOSE function, the date is entered in cell C6. Click here to download the Fiscal Year sample file. It is zipped, and in xlsx format, and does not contain any macros.